Creative Surfaces’ sign division has been busy designing a variety of signage for small businesses in and around Sioux Falls, SD. If you are looking for unique, custom commercial signage – look no further. We are your One-Stop-Sign Division! Everything we do at Creative Surfaces is custom designed. We have the largest sign division in South Dakota and an industry leader in designing, manufacturing, and installing all types of interior and exterior signage. We’ve been manufacturing signage for a variety of applications for 20+ years. We build all types of signage including – interior and exterior signage, channel letter signage, pylon signs, monument signs, aluminum signs, banners, truck and trailer graphics, vinyl window graphics, color changing and neon signage, LED lighting, can lighting and much more. 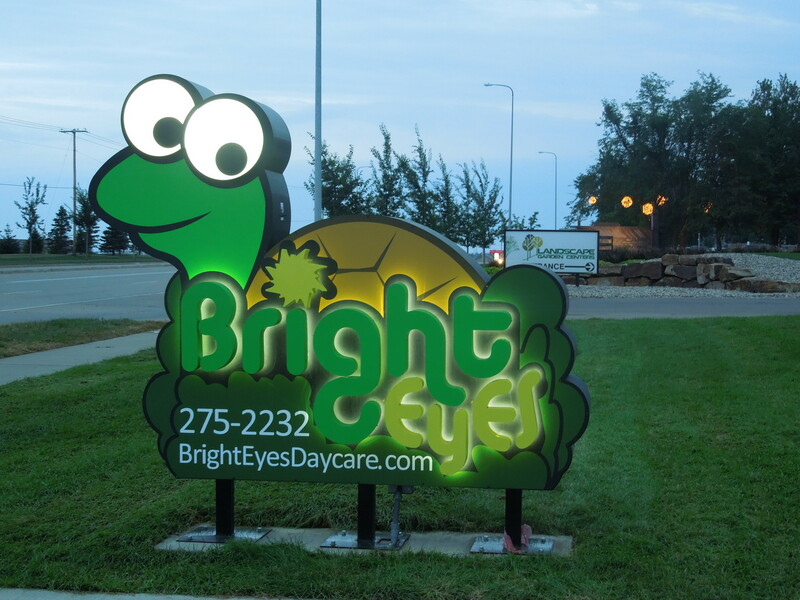 This exterior channel letter sign was recently designed and built for Bright Eyes Daycare in Sioux Falls, SD. This 8′ x 7.5′ double sided can has non-lit graphics and was intentionally designed so the head of the turtle faces Minnesota Avenue. The turtle’s eyes are backlit. 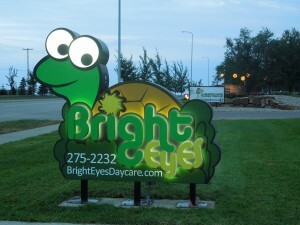 “Bright Eyes” letters and logo are reverse lit channel letters with white LEDs.